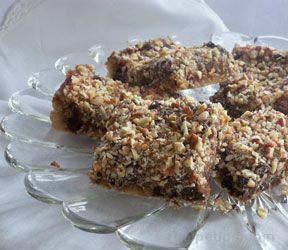 A perfect combination of chocolate and caramel make these turtle bars a favorite of any ooey-gooey bar lover! 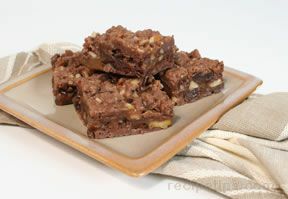 Topped with pecans they provide everything you could want in a bar recipe, sweet and chewy with a bit of crunch. 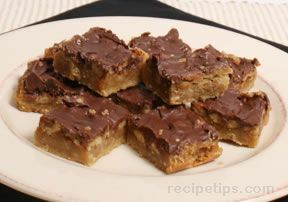 Also try other turtle bar recipes on our site. 1 package refrigerated sugar cookie dough - 16.5 oz. Press the sugar cookie dough into the bottom of an ungreased 9 x 13 pan. Sprinkle half the chocolate chips and chopped pecans over the sugar cookie dough. Press the chocolate chips and pecans into the dough lightly. Melt the butter over medium-high heat in a heavy saucepan. Add the caramel topping, brown sugar, and graham cracker crumbs to the melted butter and stir to combine. Bring mixture to a boil, stirring continuously. Pour this mixture over the crust and spread out evenly. Sprinkle the remaining chocolate chips and pecans over the top of the caramel topping layer. Bake for 25 to 35. 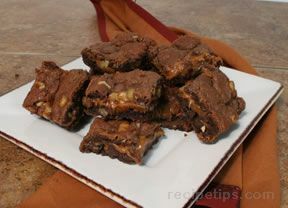 The bars are done when the edges are golden brown and the pecans are slightly toasted. Allow the bars to cool for 30 minutes; then loosen them from the sides of the pan only. Leave them in the pan to cool completely before cutting.